It's a String ThingChallenge: Spring Has Sprung ~ Not!!! Spring Has Sprung ~ Not!!! From some blog here in NC. I don't believe it. It's cold! Baby it's cold!! "Sir Walter Wally did not see his shadow, so there will be an early Spring. This is good news since there is still snow and ice on the ground from last weekend's storm and another storm may be on the way this coming weekend. So at least in North Carolina we can look forward to an early Spring." 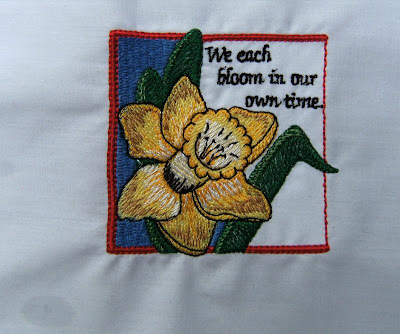 Win this machine embroidered daffodil quilt square on Kona Cotton. Wouldn't this be terrific for a quilt label or somehow incorporate it in a string block? Leave a comment and I will pick the winner as soon as I can see some yellow on my daffodil plants. Be sure to leave me some method to get in touch with you if you are my winner! Stacey, it may be a long while before you see those daffodil tips, with all the snow we are getting on the East Coast but no worries as long as I have power so I can continue to sew my UFO's. 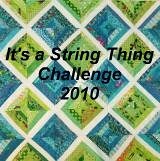 Love all your string quilts, an inspiration to make some. Have a great week-end and Happy Stitching!! That's so pretty, reminds me of when I was growing up in Northern Arizona where it snows. I used to watch for the daffodils to peak up through the snow in a neighbor's yard. "It occured to me at lunch today that there may be participants in your String Challenge who have good strategies for getting the most out of their strings or for organizing their strings. I am currently working on a set that will be 6" finished blocks and one half is darks (blue/green/purple range) and the other half is lights of the same colour range. I did the middles of all 80 blocks first since that required the longest piece. As I got a stub end or a piece that was not the length of the strip I was working on I dropped it into a plastic basket on the floor beside the machine. Then as each row of strings is being done I can use up the shorter and shorter pieces. I could use some hints about how people organize their strips. Right now I just have one heck of a mess that I paw through to cull out the colours I want. This means that some of the strips are wrinkled and need to be pressed before I use them". I save the shorter stubs as you call them and use them for the very last piece. Sometimes I only need about 1/2 inch to cover the tiny tip of the paper at the end. I also use my waste triangles from other projects as well for this last little triangular piece. During the year when I go to COSTCO, I save those plastic containers that salad mix or strawberries come in. Then I dig through my strings and decide what color combo I am going to use. I dump them all into my container. Since I am a color-controlled string quilt addict, this keeps me somewhat organized. I keep that plastic container right next to my sewing machine. When I snip off a piece, it goes into the container ready to use for the next row. Because each row gets smaller and smaller as we keep adding on. When I have a ton of little pieces that I can't use any more, I offer them for free to my fellow Stashbuster's on the Yahoo group. They make crumb quilts with them. My Aunt loves daffodils and I'm always on the lookout for something different incorporating the motif. It woudl be great to win this! What a lovely embroidery! I could see this finished in a mini quilt with string pieced borders!